What really goes into building a flagstone patio? 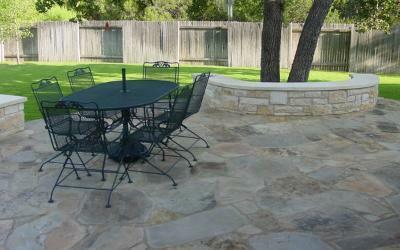 Austin flagstone patio in all it’s splendor. 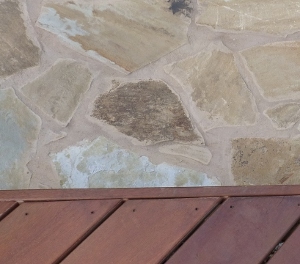 Patios are very popular here in the Austin area and flagstone patios in particular are one of the most requested type of patios among our customers. The rustic elegance they provide compliments our Texas landscape and unique home designs. Installing a flagstone patio requires a lot more steps than it may seem. The first steps begin once the dimensions are determined during our pre-construction meeting with the homeowners. Following this important meeting we then have the concrete poured to form up the shape of the patio. Sometimes the homeowner first needs to contact their sprinkler system company and have them re-locate any sprinkler heads that are in the area of the intended patio, if not Archadeck of Austin will cap off the heads. If we are building a “full-on” patio next to a house that is built on a slab our professional concrete contractor will also install rebar every two feet to connect the foundation of the patio to the foundation of the house. This extra step ensures a stable patio foundation. Once this step is completed we then pour the perimeter of the patio. We pour this 1ft. by 1ft. around what will become the perimeter footing, we also add rebar to this area as well for an added measure of strength. Most other companies just don’t take this step; we however feel it very important for the strength and life of your patio. Depending on the slope of your yard, we may install a fascia. A fascia involves the underpinning which is concrete paint that is trimmed so it doesn’t convey a rough vertical surface. We will then use vertical stones around your step areas. Typically this is not done around the entire perimeter because over time it can flake and break off so we do something that will last over a long period of time. On the top of the poured patio base we add a 4″ deep cap and pour an additional 4″ of concrete strengthened with wire mesh. 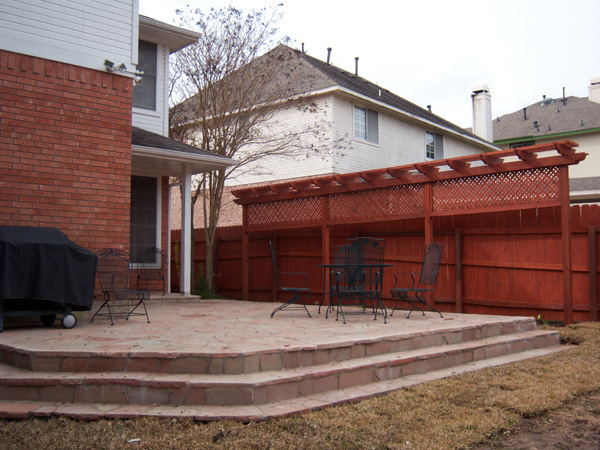 Depending on the size of your patio, we may also install man-made, control and expansion joints every 10-12′ depending on the width. Once those layers of concrete properly cure, the flagstone will then be delivered by the stone company so our expert masons can lay out the flagstone in a mosaic pattern. Once they are laid out and everything is concise, we then put in the mortar that was chosen by the homeowner. One thing we are proud of is the tight mortar joints we do so well, this gives you a flagstone patio that looks like stone when you look at and not all mortar. After all, our customers are paying for stone, not mortar. After the mortar is done, the next step is to apply a sealer. The sealer is undetectable to the appearance of the patio, but it keeps moisture from penetrating the stone and also keeps mold and mildew out. The sealer also gives the finished patio a cleaner look. After applying the sealer you shouldn’t have to do any further maintenance for 5-10 years. When the stone selections are made we generally meet our customer at the stone shop to help them with their selection and any questions or concerns they may have about a particular stone. There are actually 10-14 various types of flagstone to choose from. 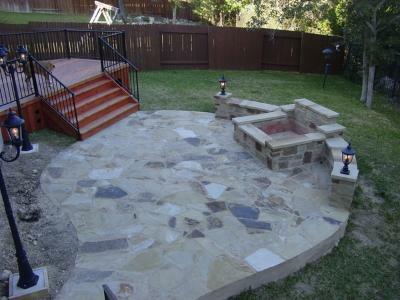 The most popular flagstone choices are Oklahoma, Arizona and Mexico. All the most widely used flagstones come from Oklahoma. 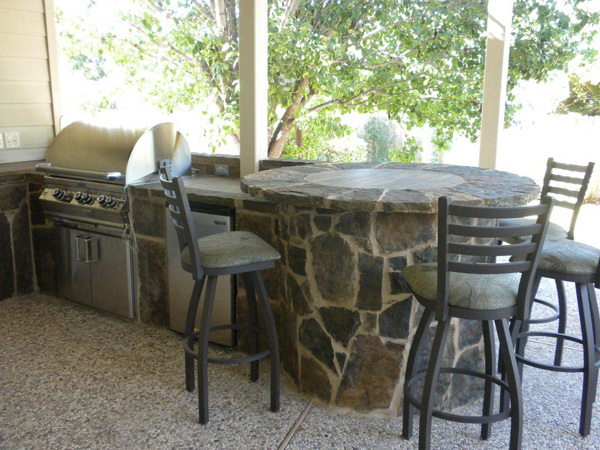 Sometimes when we use flagstone we will incorporate beautiful and useful features such as stone benches or even a stone kitchen island if your patio incorporates an outdoor kitchen. Flagstone patios are not only gorgeous, they are a solid material choice for your patio because with a stained concrete or concrete patio when it cracks, and it is not a question of if it cracks, but a question of when, you will have to live with it. When you use flagstone and the concrete underneath cracks you may get a little separation of mortar joints over time but you won’t see a line in the stone. Making sure your flagstone is installed by a licensed professional ensures the beauty and enjoyment of your patio is treasured for many years to come. To see more beautiful flagstone patio creations visit our flagstone patio gallery located on our website. This entry was posted on June 29, 2012 by austinporchandpatio. It was filed under Flagstone, Flagstone Patios, Flagstone Patios and was tagged with Archadeck of Austin, Archadeck of Austin design, Austin flagstone patio, Austin flagstone patio construction, Austin flagstone patios, Austin Oklahoma Buff Peach flagstone patio, austin outdoor fireplace, Austin patio builder, Austin precision and design of flagstone patios, flagstone outdoor fireplace, How Archadeck of Austin builds a flagstone patio, What goes into building an Austin flagstone patio.